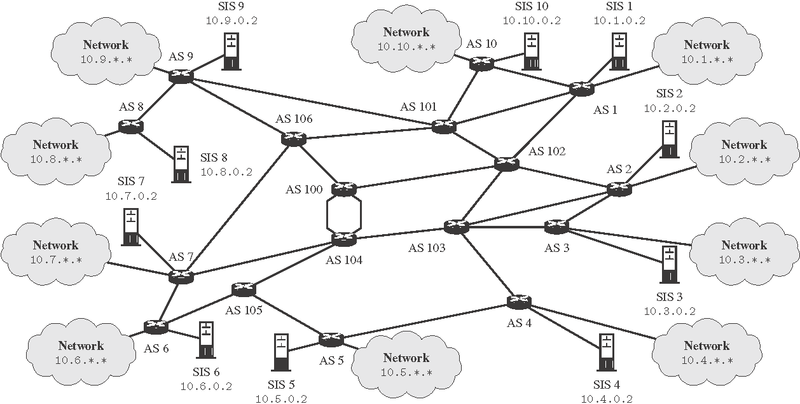 Here, the information related to our paper on P2P testbed (Zbigniew Duliński, Kamil Pałkowski, Piotr Chołda, A university testbed for large scale interconnection experiments on distributed applications, Computer Networks, vol. 63, 22 Apr. 2014.) is given. When using or inspiring by the given configuration files (either changed or not), please cite the abovementioned publication. Basically, the testbed was prepared to study the Economic Traffic Managment solutions for P2P systems. It can be also used in the context of cloud networks. Logical structure of the testbed. Physically, the testbed has been constructed in the Jagiellonian University, Kraków, Poland. It was created due to the cooperation of the Jagiellonian University and AGH University of Science and Technology within SmoothIT and SmartenIT projects. Physical structure of the testbed.